The flagship feature in Android Marshmallow can do more than just dish out movie times or find the address of a nearby restaurant. In just a short amount of time with Android 6.0 Marshmallow, Google Now on Tap has become an inseparable piece of how I use Android. It’s transformed Google Now from a helpful app that lives off the side of the home screen to the real brains of the operating system. As a quick refresher, Google Now on Tap is one of the standout new features of Google's latest version of Android. When you hold down the home button, Google scans the content of your screen and then offers links to apps, services, and websites that pertain to what you're looking at. When it works, it’s quite magical. But as we found in our Marshmallow review, the feature is certainly in its early days. It shines in situations like finding a restaurant or movie information that you discuss with a friend over text message. But after living with it for a while, I’ve discovered some other ways that Now on Tap will reduce the number of steps you would take to perform other actions. 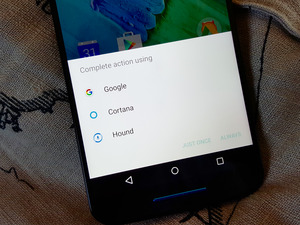 Here are five ways that I’ve found Google Now on Tap excels in everyday tasks. It’s a great start, though I expect this feature to become as essential to the Android experience as Gmail and Chrome. Following sports is about far more than just getting the score. A lot of team news, injury reports, and other details come from social media and other related apps. This is where Google Now on Tap can really give you a boost by pulling up multiple services at once. Google Now on Tap can be the right tool to help out the sports fan. As the image indicates, you calling up Now on Tap when checking a score gives you one-touch access to other apps and relevant Google search terms. The ESPN link takes you inside the app, right to a page with the team schedule. Twitter and Facebook go directly to the team’s profiles. It’s a great example of Google’s deep linking capabilities to make apps talk together more directly. 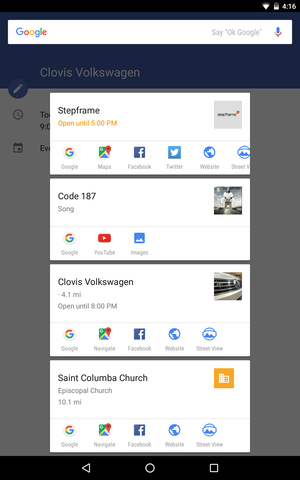 Fire up Google Now on Tap while looking at a calendar entry and you may get the name of the business, its website, and a Google Map that pinpoints where you need to head for that next appointment. Google Now on Tap can help you get to your next appointment. However, expect some weirdness: I have no idea how a song named Code 187 got in here. Some of this connection to other Google services already exists in Calendar, but launching Now on Tap gives you additional context and quicker access to more information. Try it out with different appointments and see what other surprises that you might find. While it’s still sometimes painful to do on a smartphone or tablet, I do find myself writing more frequently from a mobile device. Google Docs and Microsoft Word are particularly good on a big-screen phone like the Nexus 6P or an Android tablet. It’s not always razer sharp, but Google Now on Tap can give you some useful information during your next writing project. By accident I fired up Now on Tap once and was surprised to find a couple of cards that turned into good pieces of related research. Now on Tap doesn’t quite give you the same context as Docs’ built-in research tool, but I’ve begun to launch it more and more when writing inside a document. And if you’re using Word, which currently doesn’t have a similar feature on Android, it’s a good way to see if your subject matter can use an injection of web research. 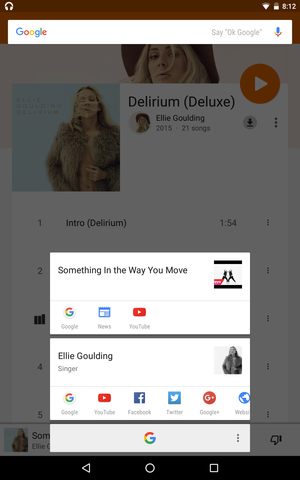 Google Now on Tap can also be an assistant DJ when you’re playing music. When you launch it inside of a music application, it will pop up related YouTube videos, the artist’s profile, social accounts, and other links. 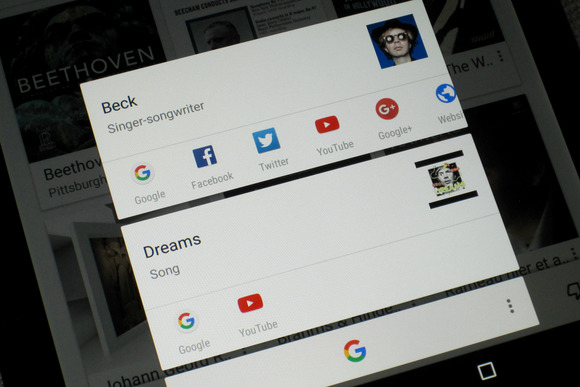 Fire up Google Now on Tap while streaming music to get links to artist profiles. Give it a try next time you’re streaming with Spotify, Play Music, or another service. Because results vary by what’s on the page, it’s worth popping it up from time to time to see what else you might discover. Sometimes when you’re reading a news article you want to know more about related topics. 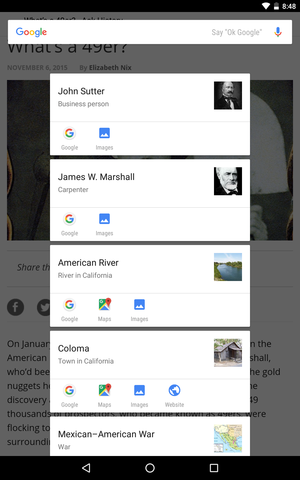 Google Now on Tap is pretty good at that—hold the button and you may find more about the subjects of the story. It’s certainly hit and miss, but at times it’s been great for giving me more relevant stuff to browse. 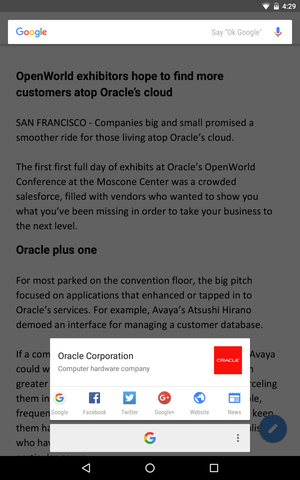 Try out the service while reading an article on the web or another app to get some related content. 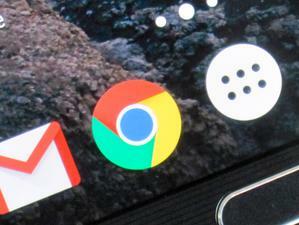 You don’t just have to be in Chrome. It works in apps like Feedly, Pocket, and of course Google News. If it’s a specific topic from the article you’re after, your best best is still to highlight that word and use Chrome’s ability to perform an instant Google search. But Now on Tap shows itself here as another case where it can be a useful assistant. I discovered most of what I described here through just raw experimentation. So if you’re one of the few with Marshmallow, try out Now on Tap in a number of different situations to see what you discover. More than likely, you’re one of the 99 percent of Android users that don't yet have Android Marshmallow. So if nothing else, maybe this will give you some excitement about what’s coming with Now on Tap in Marshmallow. I’ve said before that I felt Google Now was the future of Android. Now we know just what that looks like.